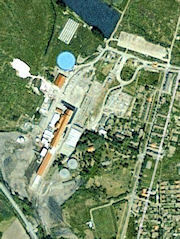 The old sugar factory in Beli Manastir did not look nice, when we paid our first visit in 2001. The civil war had affected the factory badly and its process was outdated. 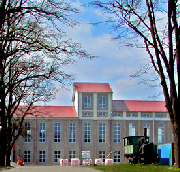 The factory, however, is located in a fertile European Corn Belt - the real asset of the factory. On local TV we presented a plan for a corn based sugar process in refurbished buildings. New owners grabbed the idea and asked us to assist with its realization. The new refurbished Starch Sugar Factory. N 45o 47' 6.33", E 18o 35' 10.27"
The factory is owned and operated by GP & Partners industrija skroba d.d., Mirka Markovica 10, HR-31300 Beli Manastir, Croatia and it has taken quite some efforts to get it that far. As a shareholder we at International Starch have participated with process engineering. Nederlandse Financierings-Maatschappij voor Ontwikkelingslanden N.V. (FMO) provided a EUR 5,000,000 term loan facility half of which so far has been drawn upon. 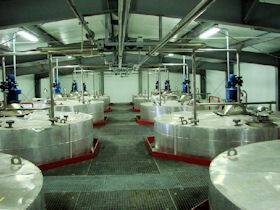 Phase One of the rehabilitation of the Beli Manastir sugar factory as a glucose- and dextrose plant has been accomplished. It is realized, however, that turning an agricultural crop into starch is in essence where profit is created. A new starch project (Phase Two) is therefore closer to take off than ever. The new starch sugars ad new life with improved future to the old Beli Manastir sugar factory compared to the previous beet sugar economy.